Climate is a statistical and aggregate study of past weather conditions over a number of years — from decades to centuries. Weather, on the other hand, comprises the day-to-day changes in temperature, humidity, rainfall and wind that we experience. Climate is often expressed in terms of months and seasons while weather is measured by days and weeks. While it is possible to provide weather forecasts, it is only possible to provide general projections for climate due to the wide time scales and uncertainties involved. Climate varies on multiple timescales due to both natural causes and anthropogenic influences. Natural causes include the climatic response to volcanic eruptions and the varying radiative input from the Sun. It also includes the local manifestation of planetary scale climate variability. The El Niño Southern Oscillation (ENSO) is an example of particular relevance to the region. 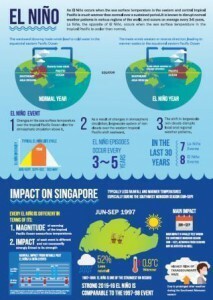 During El Niño and La Niña events, Singapore generally receives less and more rainfall than average respectively. Future changes in ENSO could substantially change droughts affecting the region. Natural variability also occurs on longer decadal and multi-decadal timescales and this can also influence the climatic conditions in the Singapore region. Based on 28 observation stations across Singapore, there was an increasing trend in annual average rainfall since 1980. However, the few station observational records that extend back to the 1950s show that the rainfall had a downward trend from the 1950s to 1970s. This illustrates the importance of inter-decadal variability and emphasizes that not all long-term trends in climate are due to anthropogenic climate change. When looking at future climate it will often be a combination of these natural signals, along with the anthropogenic climate change signal, that will be important. According to World Meteorological Organisation (WMO) guidelines, a climate station monitors the climate over a long-term period, in order to provide data that enables detection of climate change signals at the national level. It should minimally have 30 years of rainfall and temperature data, and be located relatively far away from large urban centres. Singapore’s climate station has been located at several different sites in the past 140 years. The station had been decommissioned at various points in the past due to changes to local land use in the site’s vicinity, and had to be relocated. Since 1984, the climate station has been located at Changi. The Meteorological Service Singapore, in collaboration with the UK Met Office Hadley Centre, has carried out Singapore’s Second National Climate Change Study. The study made use of high resolution climate models to downscale global climate and sea level projections for the 21st century over the region, centred on Singapore. The global projections are derived from a carefully selected subset of the latest available global climate models used in the IPCC Fifth Assessment Report. This has produced detailed, localised climate projections to year 2100 of temperature, rainfall, wind, and sea level changes over Singapore. The outputs of the study are used by government agencies to assess the various impacts of climate change on Singapore, such as the effects on water resources and drainage, biodiversity and greenery, and network and building infrastructure. The details of the climate projections are published in this report. The atmosphere and ocean interact, with the tropical atmosphere-ocean system varying on different time scales. An important climate phenomenon with inter-annual or year-to-year variability is the El Niño and La Niña, which are opposite phases of what is known as the El Niño-Southern Oscillation (ENSO). In the absence of an El Niño or La Niña, the ENSO is in a neutral phase. Under normal conditions, the prevailing trade winds “push” the surface water in the tropical Pacific Ocean westward, causing upwelling of cold subsurface water off the coast of Peru in South America. During El Nino episodes, the appearance of warmer than normal sea surface temperatures over the eastern tropical Pacific is accompanied by a reduction of the sea-level pressure gradient that drives the trade winds. The trade winds are weakened and upwelling of cold water off the coast of Peru is reduced, thus reinforcing the initial warming in the eastern tropical Pacific. La Nina episodes are the reverse, with a sustained cooling and strengthening of trade winds in these same areas. El Niño episodes typically last about a year, but some may last longer. They usually start to form during the northern hemisphere summer and reach peak strength during winter. As the El Niño peaks, the tropical Pacific Ocean overall is warmer than normal and the near surface air temperature warms up as the ocean gives up heat to the atmosphere. As the ocean has a much larger capacity than the atmosphere, it responds much more slowly to forcing from the fast changing atmospheric system. The huge difference in response times leads to self-sustaining oscillations in the tropical Pacific which peak every 3-5 years on average, producing the El Nino/La Niña phenomena. ENSO is a primary cause for climate anomalies (departures from normal conditions) in many parts of the world. During El Niño episodes, the weakening and even reversal of the normal pattern of rising moist air over tropical Asia and sinking air over the eastern Pacific alters the normal wind circulation in the tropical regions. The shift in tropical convection results in prolonged drier and warmer than normal conditions in many parts of Southeast Asia including Singapore. The effect is reversed during La Niña episodes, which typically bring wetter than normal conditions to the region. Certain shorter term variations in the tropical atmosphere-ocean system play a critical part in major oscillations. An example of such phenomena with intra-seasonal or month-to-month variability is the Madden-Julian Oscillation (MJO). The MJO is characterised by an eastward propagation of clouds and rainfall over the tropical regions from the Indian Ocean to the western Pacific Ocean, with a period of between 30 and 60 days on average. The MJO consists of two phases – an enhanced rainfall (convection) phase and a suppressed rainfall phase. The changes in rainfall associated with the different phases of MJO impact the weather in the tropics. A significant percentage of rainfall in the tropics occurs during the active convection phases of this cycle. The MJO is thus important for extended-range weather prediction over our region. The MJO can also modulate the strength of the monsoons and tropical cyclones.